There is much buzz about Chevrolet scheduling to launch its dazzling Chevrolet Sail Hatchback in the third quarter of the existing year. General Motors had unveiled Chevrolet Hatchback Sail at the Indian Auto Expo, which was organized in New Delhi this year. The Chevrolet Sail is a sensibly built car, which will definitely meet the requirements of the Indian car market and its customers. The Chevrolet Sail hatchback will cost around Rs. 4 lakh, which is an estimated figure. It is speculated that the Chevrolet Sail hatchback will arrive in three variants i.e. one diesel and two petrol. The 1.3 litre multi jet diesel engine will be a high performance engine, with the capacity to deliver an impressive mileage with low carbon dioxide emissions, whereas the other two variants of Chevrolet Sail hatchback car will come with petrol engines. One of them will be a 1.2 litre S-TEC petrol engine, which will churn out an apex power of 80.5 PS and a peak torque of 108 Nm. The other petrol variant of Chevrolet Sail hatchback will sport a 1.4 litre S-TEC II petrol engine, which will also churn out excellent power and torque. The driver is surely going to have an amazing driving experience as all the three variants of Chevrolet Sail Hatchback will be skillfully mated to a five speed manual gearbox, which will also ensure easy and smooth shifting of gears. Chevrolet India has taken care of safety features in the New Chevrolet Sail Hatchback as well. This Chevrolet car will come equipped with front and rear disc brakes, which gives an excellent braking system to the hatchback. Dual Front Air bags, Anti-locking braking system, traction control, electronic stability control, fog lamps and rear seat belts certainly enhances the safety features of this hatchback. The sophisticated 2 DIN Music player along with FM radio promises to make the journey pleasurable. It can be judged from the pictures of Chevrolet Sail Hatchback that this car is even bigger than Chevys previous hatchback cars like Chevrolet Beat and Chevrolet Aveo. 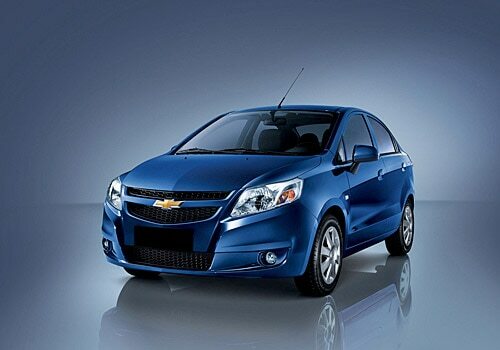 General Motors is looking forward to taking its sales in the hatchback segment to new height with Chevrolet Sail. Chevrolet Sail will undoubtedly give a strong battle to Ford Figo, Toyota Etios Lava and Maruti Swift. On the other hand the Chevrolet is also planning to launch the New MPV, Chevrolet Enjoy, which was also unveiled along with Chevrolet Sail at the Indian Auto Expo 2012. I shared that Magnificent Tata Safari Storme all Set to Descent.